Denmark Teacher Rails Against Socialism, Bernie Sanders-Truth! & Fiction! - Truth or Fiction? Denmark Teacher Rails Against Socialism, Bernie Sanders-Truth! & Fiction! A message written by a schoolteacher in Denmark makes a number of claims about free education, taxes in Denmark and the impact of socialism. 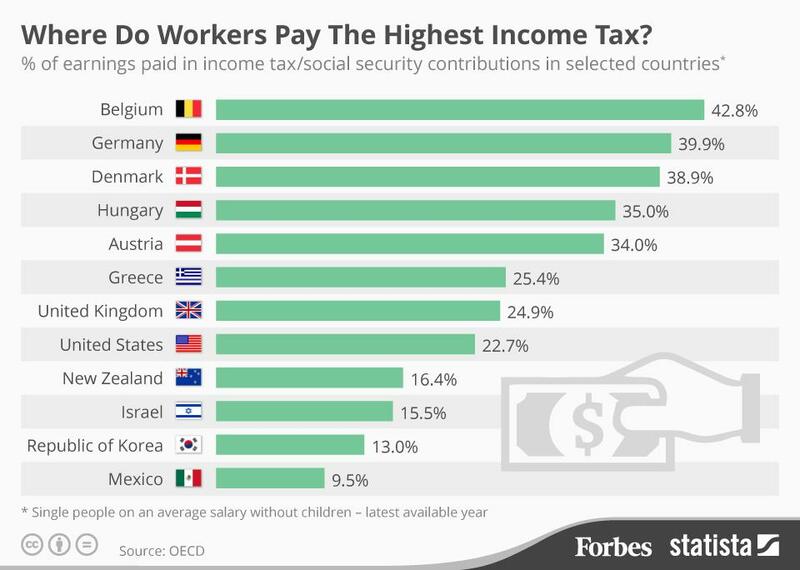 A viral meme that was allegedly written by a schoolteacher in Denmark about the country’s high tax rates and socialism’s impact on the country has been making the rounds on social media. The Minimum Income Tax in Demark is 40% – Truth! Denmark uses a progressive tax structure, which means that tax rates increase as income increases. The minimum income tax rate is 41% in Denmark, and the highest is approximately 56%. In 2015, the marginal income tax rate in Denmark was quoted at 55.80%. That means Danes would pay the marginal tax rate on all income that exceeds a certain amount. That number has fluctuated over the last 20 years. The high came in 1997 with a 61.12% marginal income tax rate, and the low came in 2010 with a 55.40% rate, Trading Economics reports. So, even though the marginal tax rate goes as high as 56%, the effective rate that most Danes pay ranges from 35% to 48%. There’s a 25% Sales Tax in Denmark-Truth! It’s true that Denmark has had a 25% sales tax rate on most goods and services over the last 10 years. Denmark Taxes 80 Cents on the Dollar-Reported as Fiction! We couldn’t find anything to support the claim that 80% of every dollar goes to taxes in Denmark. The highest marginal income tax rate there over the last 20 years has been 65.9 percent, so it’s not clear what other taxes the 80% figuring is using to get to that number. 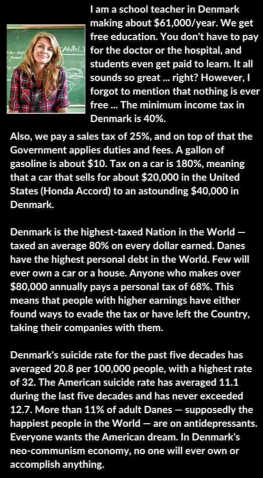 Denmark Charges 180% Tax on Cars-Truth! Denmark levies a 180% tax on cars to discourage its citizens from driving them — but automobile taxes are actually even more than that. The 180% tax on top of the basic sale prices of cars does not include sales and registration fees, ownership tax and insurance tax. When all those taxes are factored in, it’s estimated that total taxes on a car over 12 years would be approximately $36,000 in Denmark. Denmark Has the Highest Tax Rate in the World-Fiction! Denmark’s overall tax rates were ranked third highest in the world in 2015, according the Organization for Economic Cooperation and Development (OECD). Because of progressive income tax structures, OECD doesn’t use tax rates alone to determine which countries have the highest rates. Rather, it ranks tax rates based on what percentage of earnings goes toward taxes. Using that metric, Denmark residents pay 38.9 percent of their total earnings in taxes. That ranked third on the list of highest rates behind Belgium (42.8%) and Germany (39.9%). Denmark’s Suicide Rate Has Averaged 20.8 Per 100,000 People-Fiction! Denmark’s suicide rate peaked at more than 30 per 100,000 people in 1980, and it was deemed one of the world’s eight “high risk” countries for suicide in a National Institutes of Health study. However, after the suicide rate peaked in 1980, it has dropped considerably over the last 30 years. By 2012, Denmark’s suicide rate had dropped to 8.8 per 100,000, and it’s remained static ever since, according to World Health Organization data. Donald Trump Was Never Accused of Racism Before Running for President-Fiction! Obama Appoints Transgender Woman to Faith-based Advisory Council-Truth!